Since the last update work has pushed ahead on the island platform and its associated buildings. The platform itself that was previously built from Foamcore has been trimmed to shape and ramped ends were added, then the whole platform was painted with a couple of coats of acrylic paint to represent the concrete platform surface. It will still need final painting and detailing to complete the look. The vertical platform faces were trimmed with brick embossed plastic sheet. The main buildings are all but complete except for some minor detailing and painting, and have been installed onto the platform. The awnings were installed along both sides of the buildings, and trimmed using Evergreen styrene strip as fascia boards and C-channel as guttering. Plastic rod was used for the downpipes and to represent other piping on the buildings such as water pipes, sewer pipes and electrical conduit. We found it was much easier to pre-paint the styrene strip, C-channel and plastic rod in the appropriate colours before installing them onto the building. 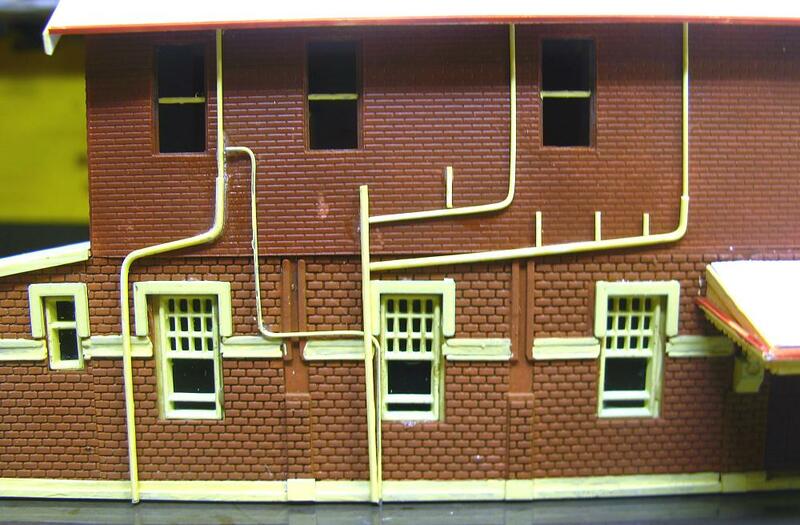 Side view of the platform building showing the pipework for the guttering, water, sewer and electrical services. End view of the platform showing more pipework. There are 2 separate buildings located on the island platform at the country end of the main buildings. Firstly is the mens toilet building and then at the end of the platform is a small brick building that we assume is used by train drivers while waiting to start work. 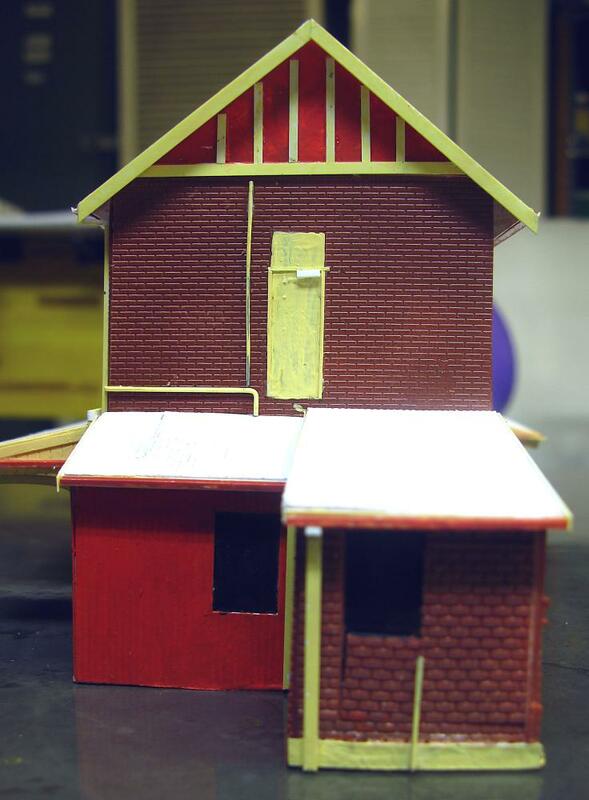 To build the mens toilet building we used the AMRI Suburban Station Building kit parts, cutting the walls and re-assembling the parts to get the arrangement of windows and doors that we wanted to represent the prototype. The roof was cut from styrene sheet and installed, and a layer of corrugated cardboard applied over the top to represent corrugated iron sheeting. The screen walls at each end were constructed from styrene strip and sheet and corrugated cardboard was applied to the outside face. The whole building was painted in its various colours and all that remains is to install various trim items such as guttering, downpipes, and other piping. 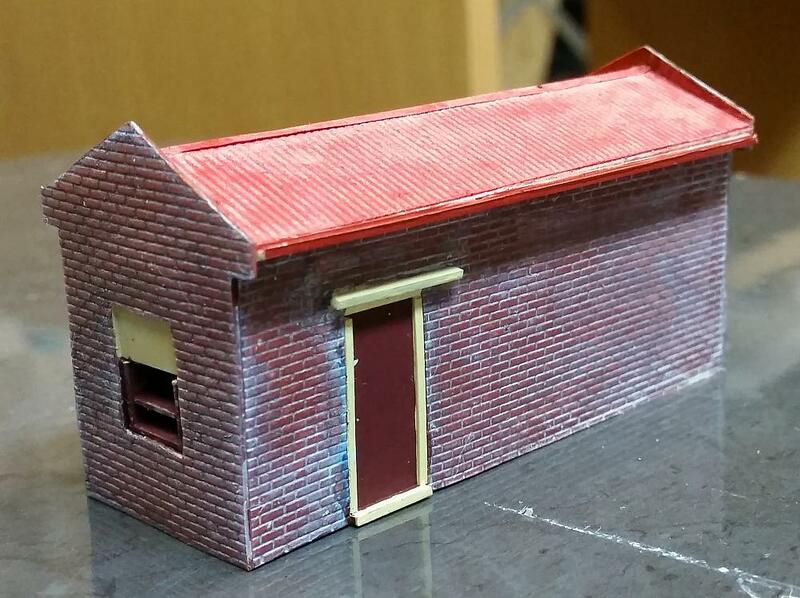 The drivers building was scratchbuilt from Slaters brick sheet for the walls, and glued to a styrene sheet floor. A pitched gable roof was built from styrene sheet and a layer of corrugated cardboard applied over the top. Most of the building was painted and again the detail trim items still need to be installed. The almost complete drivers building located at the extremity of the Sydney end of the platform.